It’s a modern Christmas tradition — amaryllis blooming indoors at the holidays. 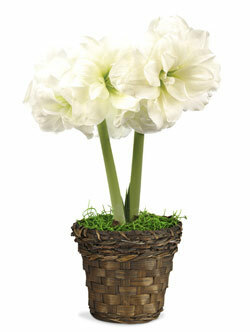 We pot a premium miniature amaryllis bulb in a basket. It arrives ready to display and enjoy as it grows quickly and bursts out in blossoms. A great flower gift to brighten the home during dark winter days.